I enjoyed the story, though very simple and basic as far as good vs. evil plots go. 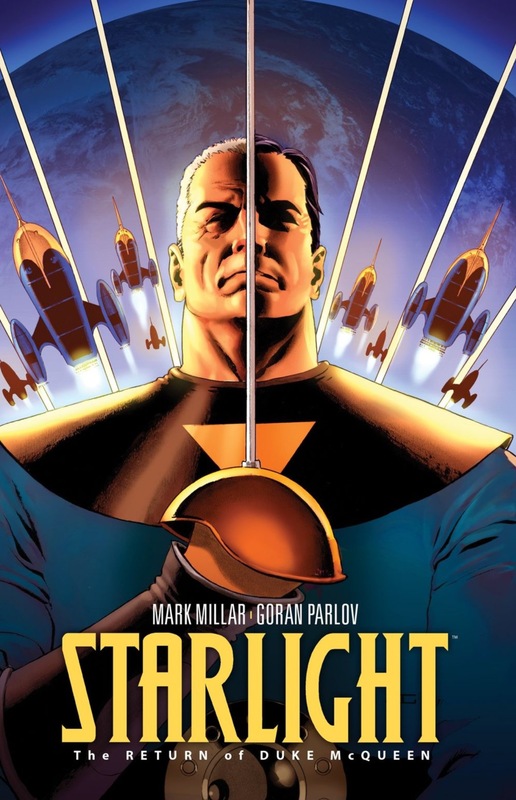 The only straight difference is the hero, who reluctantly returns from retirement from his space-faring younger days of a Flash Gordon/Buck Rogers swashbuckling time of life. Now Duke McQueen is back, where all is predictable in stopping an evil warlord. 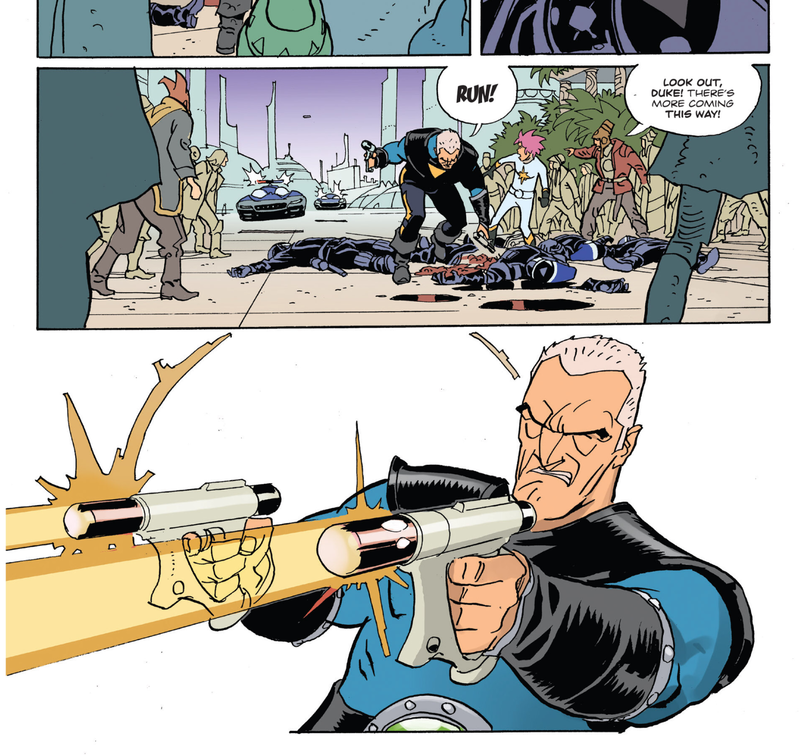 Kingfisher, as the villain is called, rules the once-protected planet as an overly evil ruler who enjoys filming executions, with no sense of remorse or redemption. The hero must band with the rebels and save all that is good here. I keep wondering if there is something more to all this. I wonder if there is something more to all this. But then again, it’s Mark Millar (Kickass, Wanted) writing, who tends to have fun with some surprising gore (a little light for this series so far, but it’s there). That’s not so much a bad thing, which adds charm for the light readers who enjoy some pulp action. I also enjoyed the humorous tidbits of culture reflecting back to our hero’s world..the late 20th century pop culture, and how nobody cared on the far-fetched exploits of our hero. Mainly in the first issue, we get some great exposition of our hero’s past exploits; something that would have made a great series in itself, if not mistaken for Buck Rodgers. But what sets him apart is a kickass spirit within, not slowed by his age. The book at times almost has a Galaxy Quest vibe, especially when we see how dependent (and non-dimensional) the Tantalus people are. Our aged here must inspire them, as to the question becomes..how would they live after he saves them? I hope there is something more to all this in future volumes. Where the book truly shines as worthwhile is the artist, Goran Pavlov. His work is breathtaking and probably heavily influenced by the classic fantasy work of Jean “Moebius” Girard. 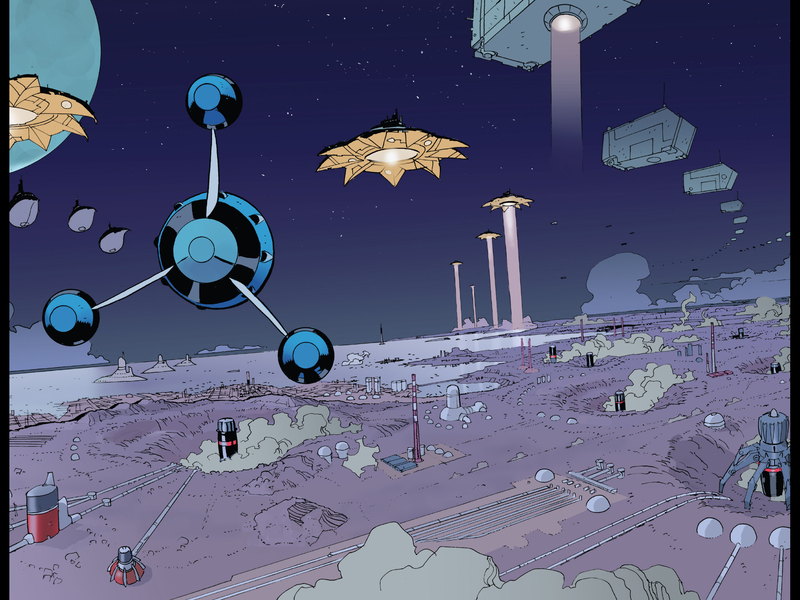 This is a good thing and sets the book apart from other space fantasy tales. The coloring is also quite grand and stylistic. The pulp era costumes and architecture is awesome, with sharp detail only when needed. The facial expressions and posing of the characters are also well done, with a bit of all era science fiction thrown in. Some I see is with the spiky hair boy sidekick reminding me of modern anime, and Kingfisher reminiscent of Ming the Merciless and every other 80s cartoon villain personality. The kind in me is very gratified, to see where all this turns out in the end. I will be reading on for more story, enjoying the art and hoping for more in literary depth. For those out there, I would recommend to those who enjoy simple fun, with gorgeous art.